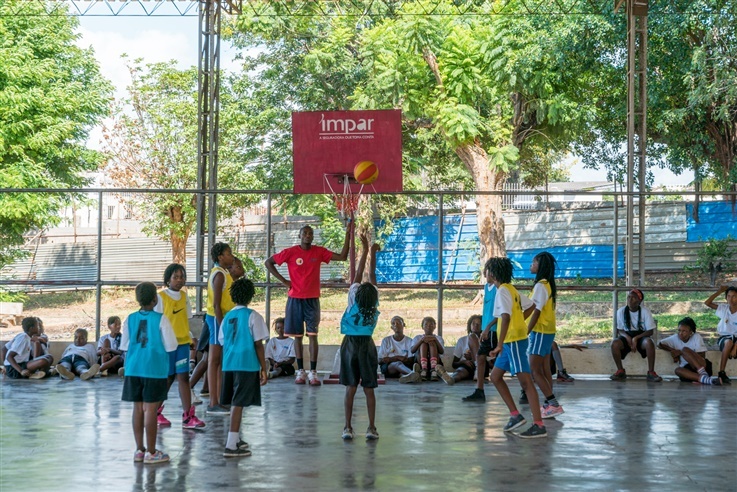 The camp was organized by Still Standing and the Mozambican Minibasquete Committee, in partnership with the Foundation Carlos Morgado, and sponsored by Matola Gas Company, in high school Francisco Manyanga between 26 and 30 January 2016. Workshop of Timbila and Marrabenta, recycling lessons and mini-basket games, were the activities that filled the five days of this initiative. The activity gathered 200 children from 6 to 11 years over a week that provided a different experience, in a safe place, where the children had the opportunity to make new friendships, bonding moments, learning new skills, improve skills in a fun and playful experience. The Summer Camp Carlos Morgado is organized in the school holiday period, in the childrens's free time and beyond the fun, we want to pass citizenship values: Respect for Parents and neighbors, Friendship, Respect for Cultural Identity, Teamwork, Positive Attitude, Leadership, Integrity and Healthy Habits. The Vumba Water and Sumol + Compal supported this event.